You might hear the word ‘budget’ and assume you’ll get an inferior product - but this design is going to change that opinion. 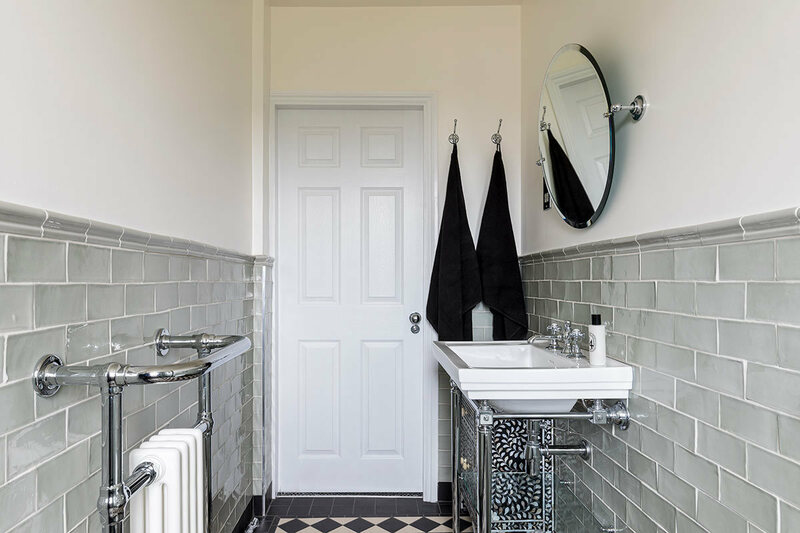 This homeowner came to us with a modest budget, but at Resi, we believe great design doesn’t have to be limited by how big your bank balance is. That’s why we came up with some classic features, while using that Resi magic to create a space anyone could enjoy. 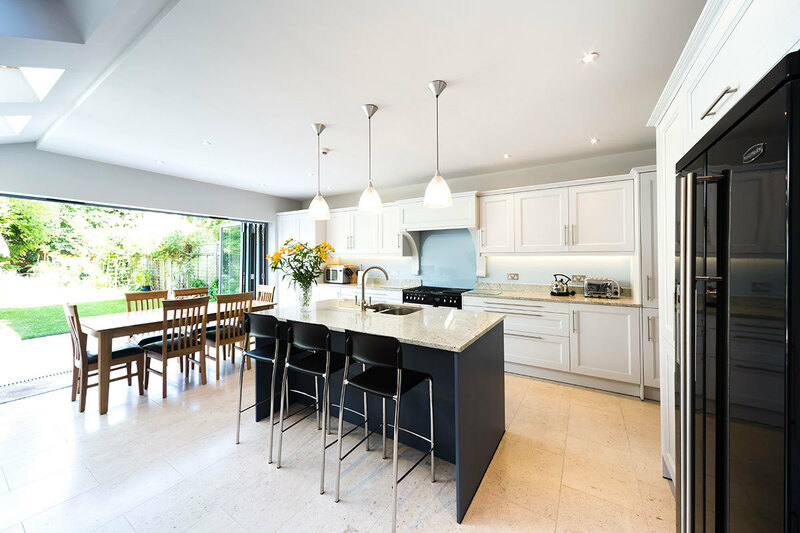 Going into this project, the homeowner’s goals were to expand their ground floor by opening out their kitchen and dining area. 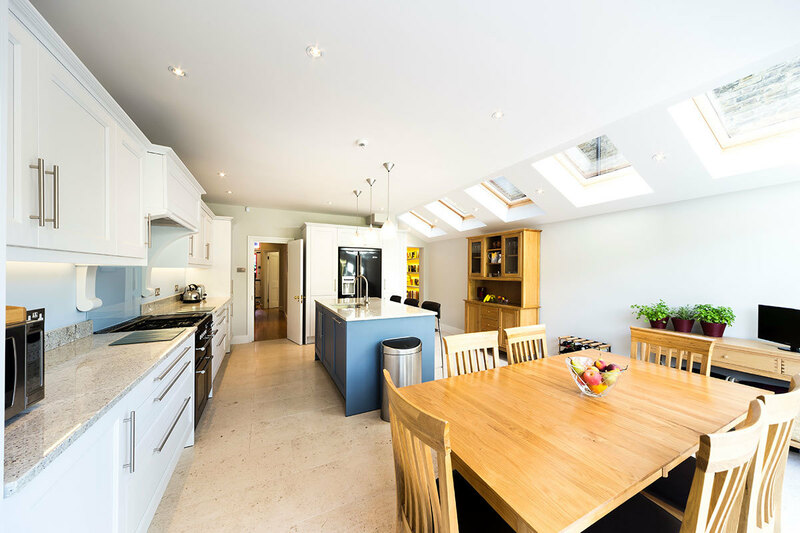 To do this, we designed a rear extension, while also tweaking some of the existing space. Right away, we spotted that their immaculate garden would provide a lovely focus for the room. 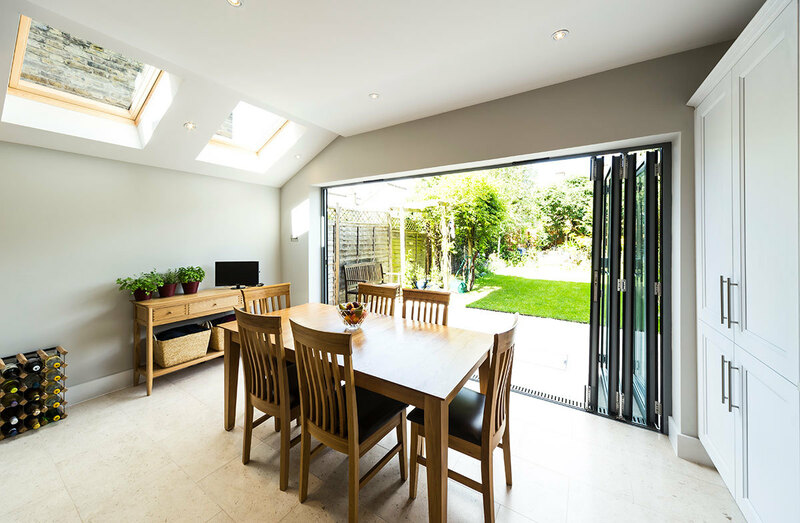 To generate maximum views of this lush green space, we added in a large set of bi-fold doors. Pulled open, this creates a bigger sense of space in the room, while connecting the inside to the outdoors. To keep more natural light pouring into the room, we added in a set of skylights, travelling along the side of the property. 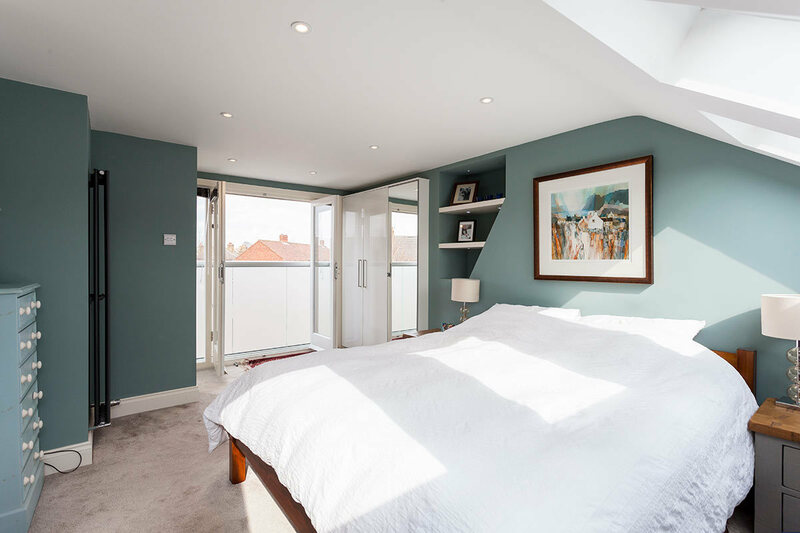 Skylights are a great alternative to glass ceilings, if you’re looking to cut down on costs. Though broken up, they still do the job of allowing light to penetrate all the way into the space. And for those darker months, we also added in plenty of LEDs. 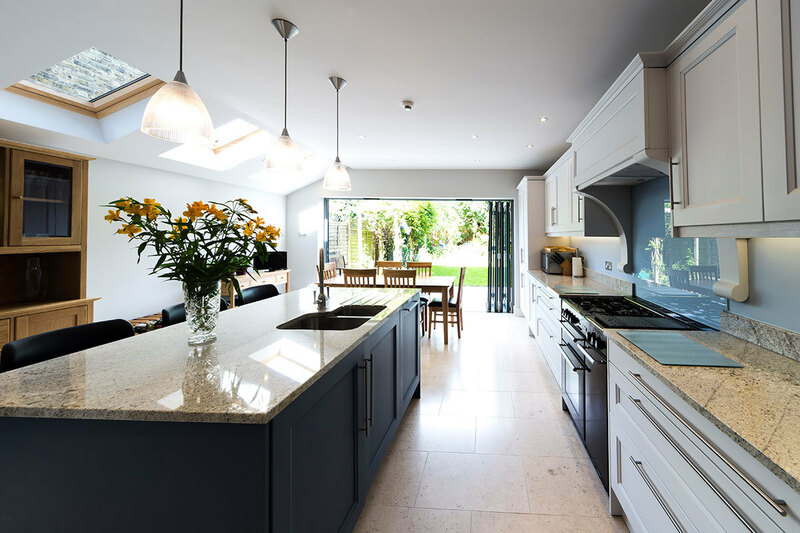 With an eye for design, the owner of this property wanted a shaker style kitchen to go inside the new extension. 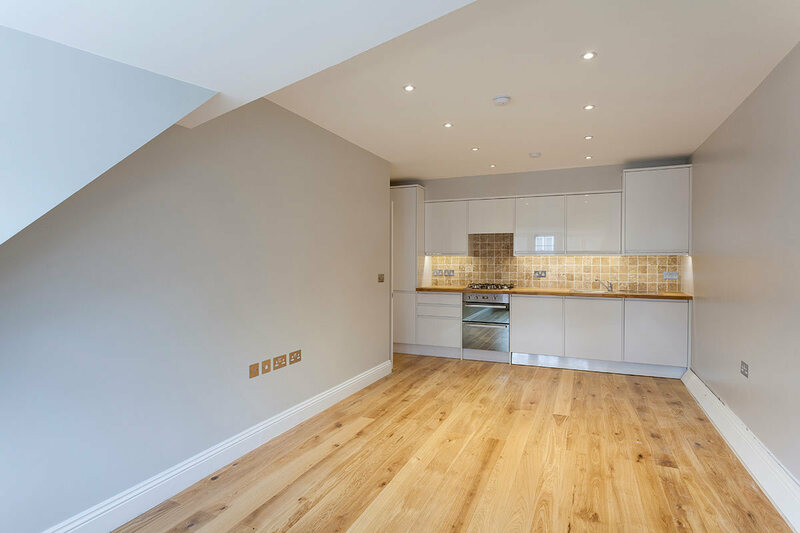 To save on space, we receded those bulky appliances - such as their large fridge freezer - into the fittings themselves. 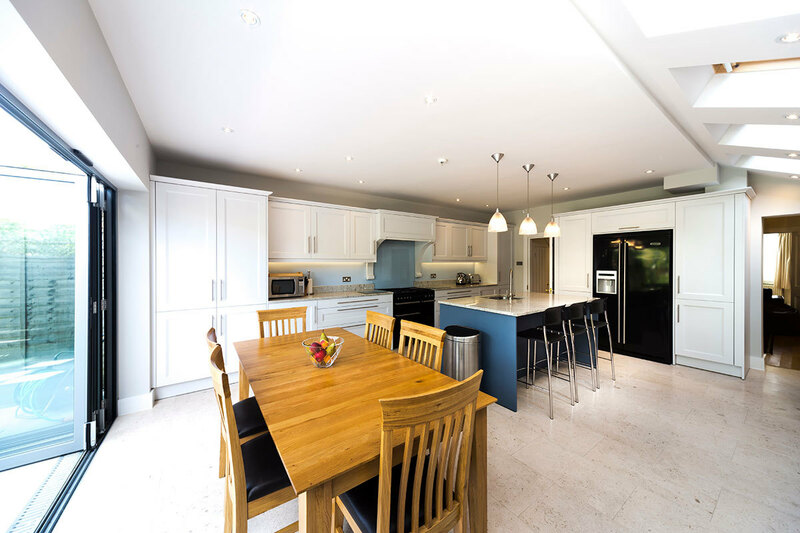 We also designed in an island and breakfast bar, so the family get to enjoy more together time, even in the early morning. Our last touches came from our designers spotting some unused space in the front of the house. Seeing an opportunity, we advised the client on giving their hallway a makeover, alongside their kitchen. This way, we were able to add in not only a new WC, but also a small library for the family! Nestled in the corner of the kitchen, this library is a quirky reading corner, that can be accessed through both the rear and front of the property, and takes this home to a whole other level. You see, great design for every budget.